Proceedings from last year's event are available, both as a free PDF, and as a bound volume at the low, low price of $7.65+shipping. We have posters! Print them out! Paste them up! Drink them with cream and sugar! ACH SIGBOVIK is the Assocation for Computational Heresy Special Interest Group on Harry Quag Bovik. The 2008 workshop will be held on April 6, 2008, on the campus of Carnegie Mellon University, located in scenic Pittsburgh, Pennsylvania. NEW!Subscribe to the sigbovik-announce mailman list to receive sigbovik announcements by email. A date has been set! 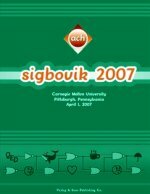 SIGBOVIK will be held on April 6, 2008 at 1pm. SIGBOVIK celebrates the inestimable research work of Harry Quaint-costumed Bovik. Since his research has been so variegated, the conference is traditionally a forum for discussion on many subjects: Inept Expert Systems, Deep Space Navigation, Science, Perplexity Theory, Thaughmaturgic Circle, Self-Adjusting Computation, Denotational Semantics of Pidgin and Creole, Blog Shapes, Team Description, Lunar Crater Exploration, Dynamic Mesh Refinement, Natural Intelligence, Artificial Stupidity, Elbow Macaroni, Rasterized Love Triangles, Synergistic Hyperparadigmatism, Computational Archaeolinguistics, Modal Types for Mobile Code, Operational Semantics of Chevy Tahoes, Hyper Driven Devices, and any other topic approved by the conference organizers. The Program Committee seeks submissions on the entire range of topics. Both full-length papers and short abstracts are appropriate. 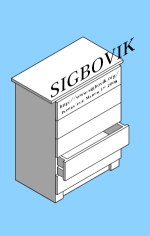 Submissions should be sent as ps, pdf, or plain text to info at sigbovik dot org. Authors of accepted manuscripts will be allowed (but not required to use) twenty minutes to present their work. Any unusual requirements, such as additional time/antitime or special equipment, can and should be arranged through the organizers at the same address. There will also be a poster session, and a wide range of poster formats will be accepted as submissions. We will also accept prerecorded talks. Data Mining Disasters: a report. Because of the aforementioned diversity of interests covered under the purview of SIGBOVIK, the SIGBOVIK 2008 organizing committee is also soliciting (in text format) short literature-review-style pieces relevant to the topics above. Work published in informal/speculative/future/tentative venues is also accepctable. Please include your name, the paper's title, authors, and a short description, as well as the previous place of publication (if any). We encourage you to print out these posters and put them in relevant places, such as science buildings, coffeeshops, and your forehead. We also encourage you to make your own posters, either for advertising or for the poster session at the conference. You may register for the conference at no cost by sending an email containing your name(s), approximate dry volume, and abridged personal history to info at sigbovik dot org. Registration is optional, but encouraged. The program will be announced as soon as it has been programmed.